Located in the beach resort of Moliets on the Landaise Coast, these superb, detached holiday villas boast their own private pools and are nestled amongst the pine trees on the edge of the Moliets Golf Course. Each of the spacious villas has individually designed interiors, with light and airy open plan living/dining and kitchen areas, with decorative log fires and large patio doors leading out onto the private screened pool terrace with sun loungers, pool side table and chairs. The en-suite bathroom in the master bedroom also has a jacuzzi/whirlpool bath. All the facilities at the Résidence Hôtellière-du-Golf are a short (800m) bike ride or walk away including tennis courts and the club house. Another short bike ride (800m) or brisk walk and you are on the sandy beach that Moliets is famous for. Amongst the activities on offer there are two dedicated swimming areas with life guards and waves suitable for surfing and body boarding, beach volley ball and a beachside kite flying area. All on ground floor: Living/dining room/kitchen with double sofa bed and patio door to terrace. Three bedrooms (may be double or twin), each with patio door to garden, one with en-suite bathroom with shower over bath. Shower room. Two separate WCs. Sun loungers NB: Spa baths in some villas. Location: 800m from Moliets Plage (all facilities, beach). 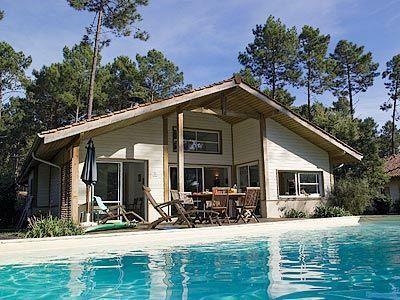 Location: 800m from Moliets Plage (all facilities, beach).